There are many different styles and sizes to choose from as well as many pitfalls to watch out for. Hot tubs and spas can be stand alone units or can be incorporated into your poolscape. The location of the hot tub or spa will be determined by your lifestyle and how you plan to use it. If you plan on using the hot tub or spa during the winter months we try to locate it in close proximity to the house. 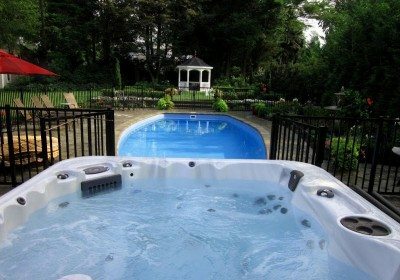 If the hot tub or spa will be incorporated into the poolscape, we use a technique so that the hot water is not lost while spilling out into the pool. The professionals at Green Island Design will discuss these options and more so you can enjoy the comfort of your hot tub or spa with your friends and family for years to come.